What is The Best Laptop Stand for Lying in Bed? I think we can all agree that trying to type on a laptop in bed can be quite bothersome, especially when the laptop shifts every time you move or type a sentence. Well, there are a few products designed to solve this problem for you. These are called bed stands for laptops, a type of mini portable desk that makes working in bed much easier and comfortable. They keep your laptop stable, and you throw in some other items, like a notepad or tablet. So the next time someone complains about you being in bed all day, send them a picture of your fancy laptop bed stand, and watch as the jealousy flows through them. Why Do I Need a Laptop Stand? You need a laptop stand because looking down at your computer screen for long periods of time can have a terrible impact on your posture, not to mention neck pain. Laptop stands keep the laptop in front of you, at eye-level, so you don’t need to hunch over to do your work. Much easier on your neck and posture. Surprisingly, there are quite a number of laptop bed stands for beds, with a range of prices. In this section, we’ll look over the budget models, so you can play around with the idea of lap desks while deciding if a more expensive model suits you. Our Rating:  (3/5 Thumbs Up) – Simple and cheap! This is one of the cheapest laptop desk stands for bed. It’s rather basic, with a flat table top. Although it doesn’t offer any mind-blowing features, it is comfortable to use, and supports up to a 15 inch laptop. The backside of the stand contains two fleece cushions for your lap, making it a comfortable and convenient choice. Overall, there’s nothing particularly special about this model. It’s comfortable and can be used for working on a laptop, reading books, drawing and other activities. Not adjustable. It only weighs 1.46 pounds. Less than a kilo. The reason this product takes the lead is because it’s the cheapest out there, a very basic and well-rounded model. Great introduction to the world of laptop bed stands, and there are plenty of colors to choose from. Our Rating:  (4/5 Thumbs Up) – Love the wooden desk. This is a fancier model, although a little pricier. The desk has a slim wooden surface with memory foam on the bottom, making for a slick and comfortable design. It’s also slightly larger than the previous model, and it can support a 20 inch laptop, with a little bit of room to spare for a mouse. Overall, this wooden lap desk offers plenty of space for your laptop, books, and other accessories. I personally like this stand more because the wooden style resonates with me, and I’m a huge fan of memory foam. Though this model looks much fancier than the previous one, it weighs significantly more, coming in at 4 pounds, almost two kilos. You can also choose between two colors. At first glance, this lap desk looks like a painter’s easel. The Winsome Wood Baldwin Lap Desk is a best seller, and there are good reasons for that. 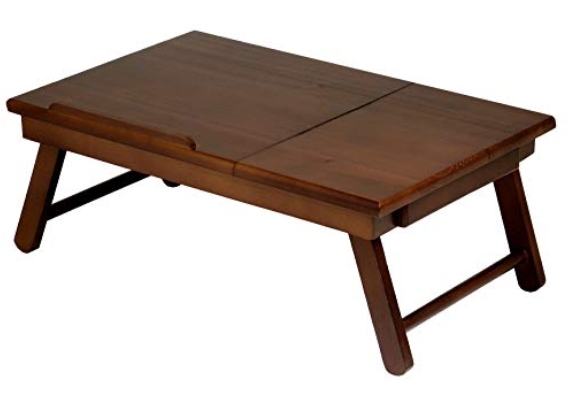 This model comes in three colors: Natural, Teak, and Walnut (most people choose walnut as it’s darker). Although this desk is not specifically designed for laptops, more for reading and other activities, laptops can fit on it as well. 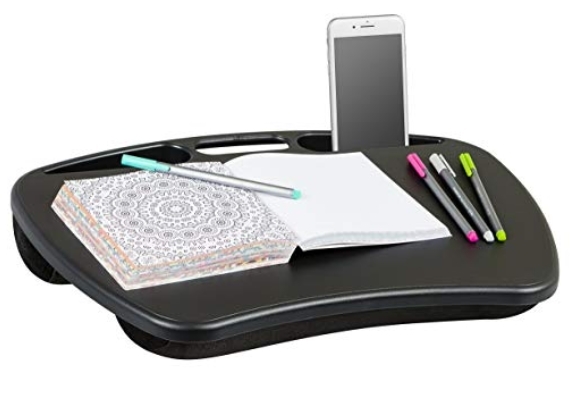 What makes this product interesting is it can stand on it’s own, so you can place it on the floor, on a couch, or prop it over your lap while you work in bed. Couple of other notable features are the small drawer on one side for pens or other stationary supplies and the adjustable flip-top. The main area of the top can be adjusted to different angles, while one side remains stationary, creating a stable flat surface for other items, like drinks or pens. Be careful when wiggling around, you don’t want to spill your drink! Overall, I like this model, especially the fact it’s made entirely out of bamboo and has legs of it’s own. Great for writing articles in bed. A personal favorite! Let’s face it, if we had the ability to adjust our height, we would. Although most laptop stands are suitable for the average person, they’re not suitable for everyone. There’s nothing more frustrating than ordering a product only to find it’s the wrong size, and now you have to go through the process of either refunding or throwing it away. That’s where adjustable laptop bed stands come into the picture. With these stands you can adjust the height to meet your needs, and hopefully you won’t have to hunch over to work on your laptop. I’m sure I don’t have to tell you how bad hunching over for long periods of time can be for your overall health and posture. 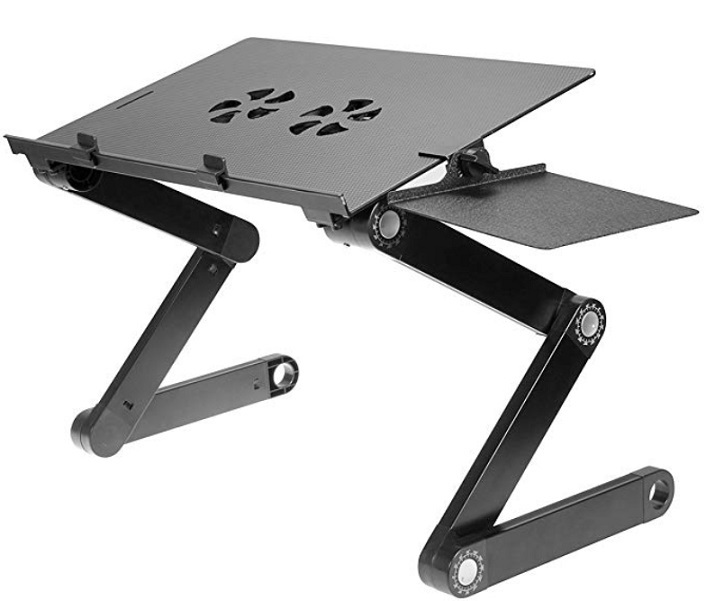 Without further delay, let’s take a look at some adjustable laptop bed stands. Here is a collection of my favorite adjustable laptop be stands. Let’s start with the cheapest product on the list, sold by Amazon Basics. This adjustable laptop bed stand resembles a sun-bed, with 6 height settings. One thing that’s great about this item is the attention to heat. Even though laptops are designed for, well, laps – it’s actually not recommended to use them on your lap because the fabric from your clothes blocks the ventilation ports. Laptops need to breathe too. And when the exhaust ports are blocked, that heat goes back into the laptop, which can throttle the performance and lead to other, more drastic, damages. 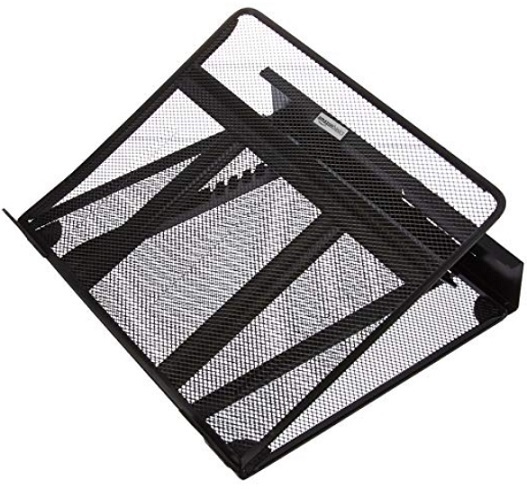 Getting back on topic, this product is a metallic mesh, which offers plenty of airflow for your laptop’s cooling needs. It’s a very cheap and budget-friendly model, and can be used on desks as well. The only downside I have is there are no cushions on the rear end, so you’ll feel the hard cold metal on your laptop, and the edges are quite pointy, too. (5/5 Cartwheeling Emojis) – Our Favorite! Although this item is a bit more expensive than the previous product, it also offers more features and is generally more comfortable to use, especially in bed. This model includes two versatile legs that fold out from underneath the table, making it easy to pack and assemble. The height of the legs can be adjusted too by using auto lock buttons. The angle can also be adjusted, using dials on either side of the desk. 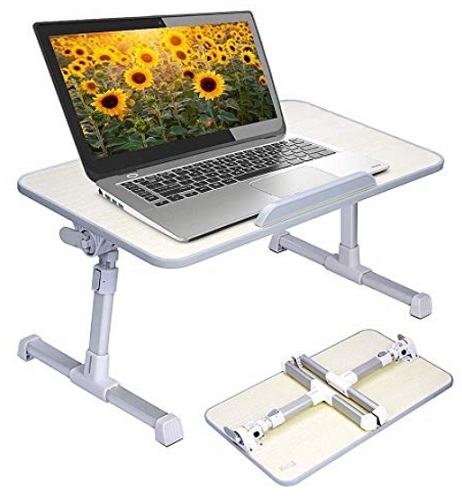 In short, this is one of the most stable and budget-friendly adjustable laptop bed stands out there, and it offers plenty of customization options. I really like how you can not only adjust the height, but also the angle, it makes a big difference. Not to mention it’s very easy to pack, lightweight, and very stable. Recommended choice. This model comes in two sizes and colors, Large and Standard, and American Cherry and Honeydew. Personally, I prefer the American Cherry as it adds a wooden finish to the top of the table, which I think is much more aesthetically pleasing than the Honey dew color. (3/5 Cartwheeling Emojis) – Great mobility, but a little unstable. 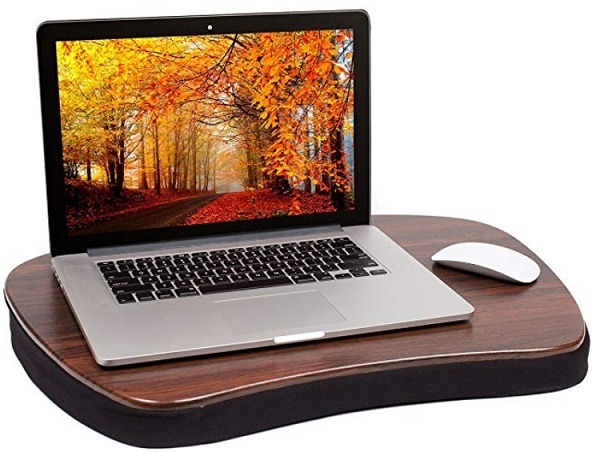 When I first came across this laptop table, it looked like something you would attach to a desk or a table. It certainly doesn’t look that great. On the other hand, it proved to be quite versatile, especially when it comes to heat dispersion. This is another metallic mesh model, except this one includes a built-in USB external fan to cool your equipment. The legs of this model look like something out of star wars, but they’re actually rather useful. The potential height adjustments are incredible, as there are multiple mechanical hinges or joints on the legs, a total of six, and they can be locked in place. It promises 360 degree angles to fit any body position. Although when it’s extended it doesn’t look that great, it’s very light, and great at keeping laptops cool. What I liked most about this model is the external USB fan and the adjustable legs. The level of customization is great too, not many laptop desks can compare. The downside is it’s not very stable. Can’t make a decision? Out of the six products we mentioned here, I’ll narrow them down to what I think are the best laptop stand for lying in bed. Although this product is fixed with no possible adjustments, the memory foam and wooden design look great. It’s also one of the cheaper models out there. It doesn’t provide many features, but it’s comfortable, lightweight, and versatile. I think everyone should own at least one of these, they’re great for kids to draw and play with as well. Avantree makes a lot of great gadgets and accessories. Their large size American Cherry adjustable laptop bed table is one of my favorite. Out of all these stands, if you have to pick one, you can’t go wrong with this model, it’s my recommended pick. Why? Because it’s not expensive, the wooden finish looks great, it’s stable, and you can adjust the height and angles. Basically it has everything I look for in a good adjustable laptop bed stand. It also works great as an addition to regular desks, raising the laptop to your eye level so you don’t need to constantly lean over. Save your spine. It will thank you. Buy it here (Links to Amazon). Are Laptops Bad for Posture? Laptops are not inherently bad for your posture, but it is easy to forget about posture when using one. Generally, most people who suffer from neck pain spend too much time looking down at their computer, which puts a lot of stress on the back of your neck, which leads to neck-pain. Using a laptop in bed with the laptop on your lap is actually a terrible position because it forces you to look down at the screen, and this can lead to neck injuries. That’s why it is so important to remember to keep your back straight and make sure your laptop or monitor is at eye level when you work. This can be accomplished by using the laptop stands and desks we mentioned in this post. Ideally, you should use a laptop while seated, at a desk, with an adjustable portable laptop desk on top of your office desk to prop the laptop up to eye-level. It’s easier said than done. But there are plenty of portable adjustable laptop stands and desks you can use. In this post, we talked a lot about posture and getting work done while in bed. Chances are you found yourself straightening your back and adjusting while reading this post. If that’s the case, well done, that’s one step in the right direction. Laptop stands can position your laptop right in front of you, at eye level, so you don’t need to hunch over, because that’s terrible for your neck. With the right laptop stand your neck will be safe, and you’ll be able to work more without having a sore neck. Thanks for taking the time to read this post, and I hope you put a bit of effort into maintaining your spine and neck health.